Mount Evans has always been an alpine bouldering location in Colorado. It was developed well before RMNP and Chaos Canyon and has some of the hardest boulder problems in the United States. Area A with The Dali Boulder, No More Greener Grasses and Ode to the Modern Man all represent what used to be the pinnacle of difficult bouldering in Colorado and most of America. However, Lincoln Lake (aka Wolverine Land) has only recently gotten the attention that other alpine bouldering destinations have received. In the last couple years problems from V2-V14 have been discovered and at an alarming rate. Just last year Dave Graham and Daniel Woods put up an astonishing 14 V13's or harder at Lincoln Lake. With a finite amount of development and a veritable "gold rush" in the last couple years, Lincoln Lake has become the new hotspot for bouldering in Colorado. Everyone from Jon Glassberg and Carlo Traversi to Daniel Woods and Ben Scott (local Fort Collins FA'er) have come to cultivate this new alpine bouldering gem. The granite is fine and featured and the access has been preserved by a few local climbers including Jamie Emerson working closely with Park Rangers to establish trails and regulations. Emerson recently came out with a guidebook for Areas A and B of Mount Evans and Chaos Canyon in RMNP, but decided to leave out Lincoln Lake after talking to rangers and discussing it with them. Plus the guidebook was years in the works and with all the new problems going up at Wolvo he would have had to delay the publishing even more. The setting is beautiful and as far as alpine bouldering goes could not be prettier. Much greener than Chaos and better vistas than the other areas of Mount Evans, Lincoln Lake offers some amazing bouldering for the few who dare the brutal hike, changing weather conditions and maze of talus. More on that later. Overall this place is great. The lack of a topo or guidebook makes for some interesting searches, but it is well worth it when you stumble upon problems like Chalk on Rock and Unshackled. A few times down to this talus maze and you could have a pretty good mental image of the layout. Speaking of the talus the hike is pretty stout. You park just off summit road and hike downhill about 800 vertical feet (maybe 1/2 mile) to Lincoln Lake. This is nice for the hike in, but the grueling uphill hike out looms over you like a black cloud the whole time you climb. You definitely have to be in shape for this place. Once down the hill the talus reveals itself as an incredible mess of car and house size boulders. Turning every corner gives you hope that problems are everywhere. 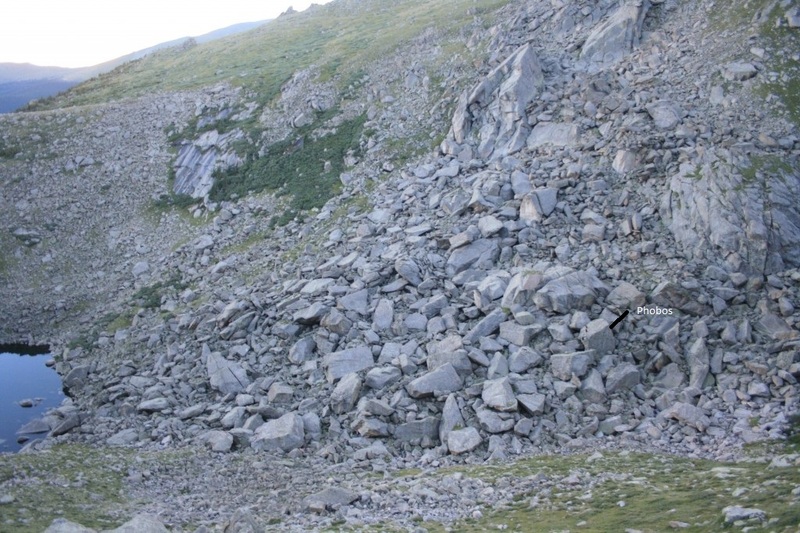 Unfortunately, like with most alpine bouldering areas, there are not problems at every turn. Good concentrations exist, but overall it is a hunt with thousands of boulders and great possibilities. There are even plenty of easier problems no one has bothered to climb yet. Some of these are right next to established areas because typically hard climbers putting up V10+ problems don't bother with anything under, say, V5 unless the line is visually stunning or a no-brainer. Luckily this leaves some fantastic FA's for mere mortals like myself and most of my friends. Sure we shoot for V8+, but when it comes to FA's we have to dial it back a little (all the pros get the good FA's). Right next to Chalk on Rock, a pretty well know V8, were a couple boulders that held some potential for easy warm ups. We basically stayed in this area, right around Chalk on Rock. It's right off the trail and because of the number of people we were with we just set up camp and climbed what was right around us. There were a couple other problems that everyone tried out and of course we worked on Chalk on Rock as well. We did not know the beta and so the way we climbed it made it significantly harder. I'll have to go back to get this classic. storm. My girlfriend Ryann is on the camera. I mentioned the changing weather earlier and for good reason. The weather can change in a heartbeat when you are up around 10,000 feet. Clouds roll over cliffs and crest mountains without any warning. This happened toward the end of our day and within seconds we were in a hail and thunder storm. We hunkered down underneath a small roof and waited it out. These types of storms typically last between 5 and 30 minutes. Luckily this one was done in minutes and after the storm passed we headed out. The hike out was demanding and we took our time, but the day was a success for a new area with limited understanding of what's there. There are quite a few problems I know of that I am super excited to get on, Kryptonite, Bull Run, Rebel Yell, Cutlass, Northern Aggression and Powder Keg are just a few. So many problems...I can't wait to get back. Check out Glassberg's Chapter 1 of "Lincoln Lake Giants" below. This film series has pretty good production and gives you an idea of the Lincoln Lake area.